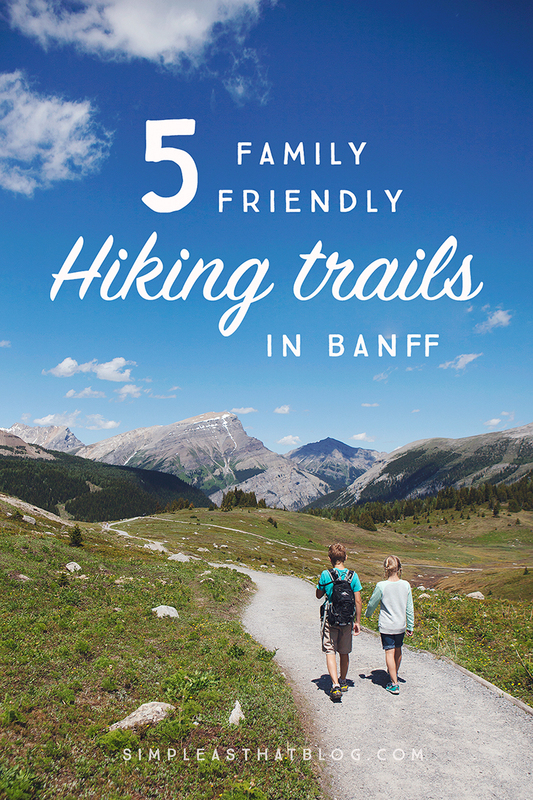 5 Family Friendly Hiking Trails in Banff National Park – beautiful hikes to explore as a family in Banff any time of year – winter, spring, summer or fall. We’ve been hiking with our kids since they were small, and of all the benefits we’ve gained, the most valuable for us has been the bonding we’ve experienced as a family. We have made so many fun memories together on the trail. 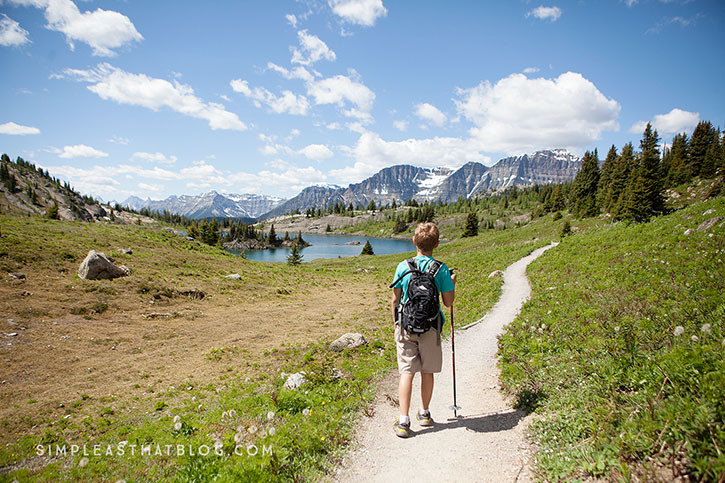 In June we had the chance to explore some amazing hiking trails in Banff National Park, and we wanted to share our top five with you. These hikes are gorgeous in the spring and summer, but all of them can be enjoyed in the fall and winter seasons as well! 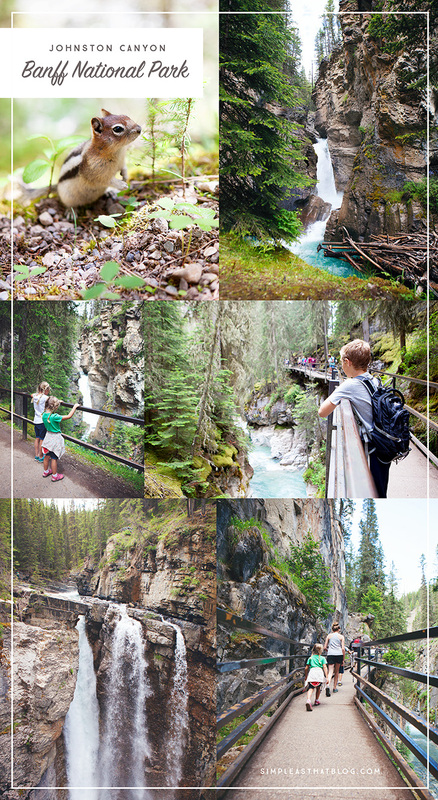 Johnston Canyon was the #1 hike we wanted to take the kids on while visiting Banff. My husband and I hiked this amazing trail sixteen years ago on our honeymoon in the winter, and the frozen waterfalls were a sight to behold! We wanted to see it in the warmer months and this time share the experience with our kids. 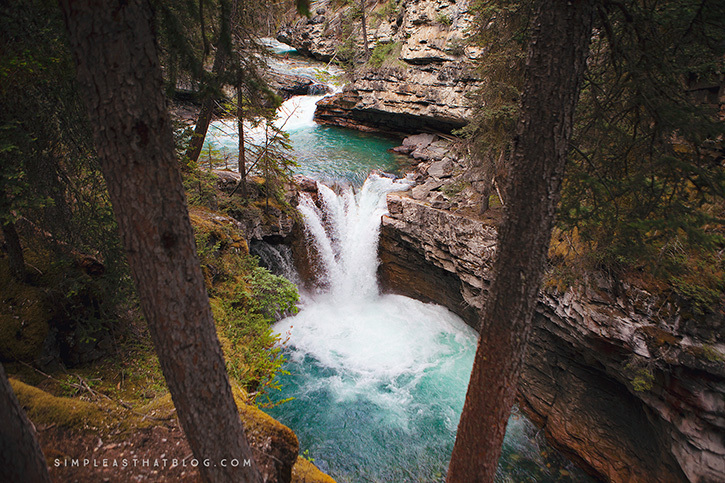 Johnston Canyon is 25-30 minutes from Banff. If you’re planning to make the drive I’d recommend starting out early in the morning to avoid crowds. It’s a popular trail and can get quite busy during the day. 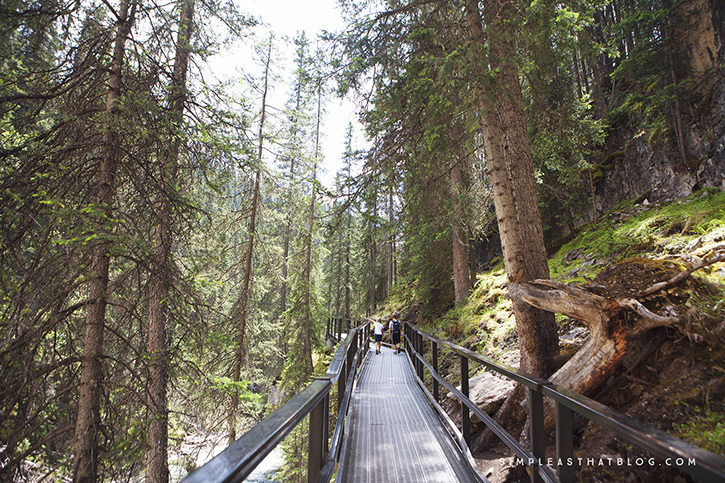 The trail winds its way through Johnston Canyon on steel catwalks that have been attached to the canyon walls. You’ll find strategically placed lookouts along the trail for taking in the sights and capturing some beautiful photos and sturdy railings to keep everyone safe. Depending how far your little hikers are able to go, you can view up to seven beautiful waterfalls along the Johnston Canyon trail. You’ll reach the lower falls after a short 20 minute walk, where you can duck into a cave and get super close to the roaring water. The second set of falls are 2.7km (1.67 miles) into the canyon. Just as we remembered, the views were incredible, and our kids loved the adventure. 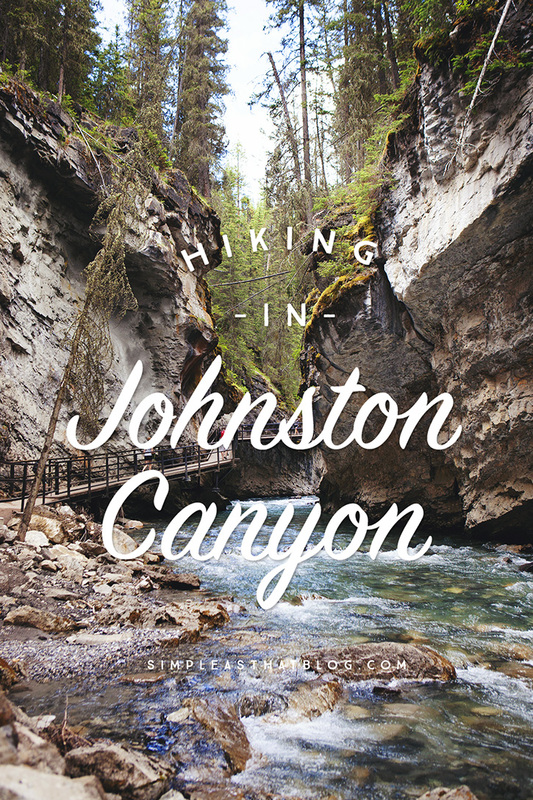 Johnston Canyon trail is open and well cared for year-round. When we hiked it on our honeymoon, we were fascinated with the ice climbers scaling the majestic frozen falls, and now that our kids have seen it in the summer, we’d love to take them again in the winter months for a different perspective. This beautiful, glacier-fed lake has some of the most gorgeous views I’ve seen. 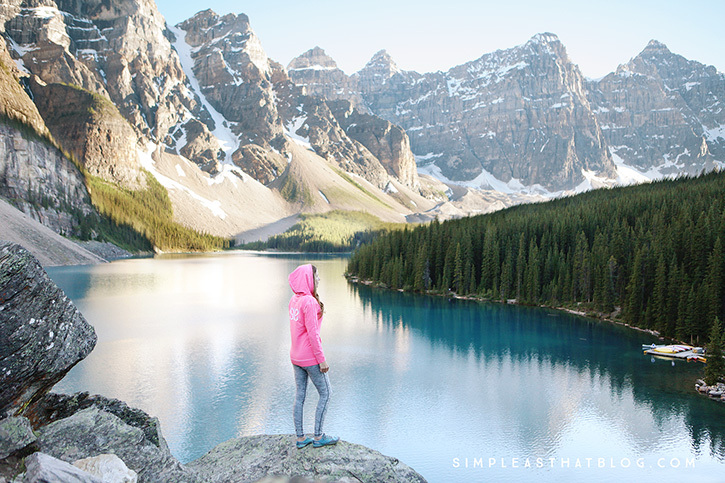 The Rockpile Trail is the most popular hike at Moraine Lake, offering the best view of the lake. 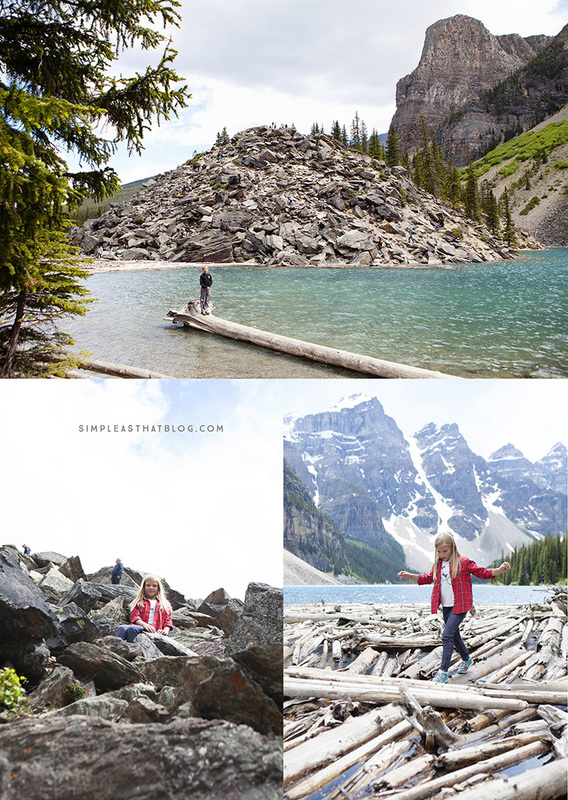 Our family loved it so much we did it twice during our week in Banff. Once you’ve made the 12km drive up Lake Louise road to Moraine Lake the Rockpile itself is clearly visible from the parking lot. After a short climb our family came to the lookout area at the top of the Rockpile overlooking this magnificent aqua-colored lake. 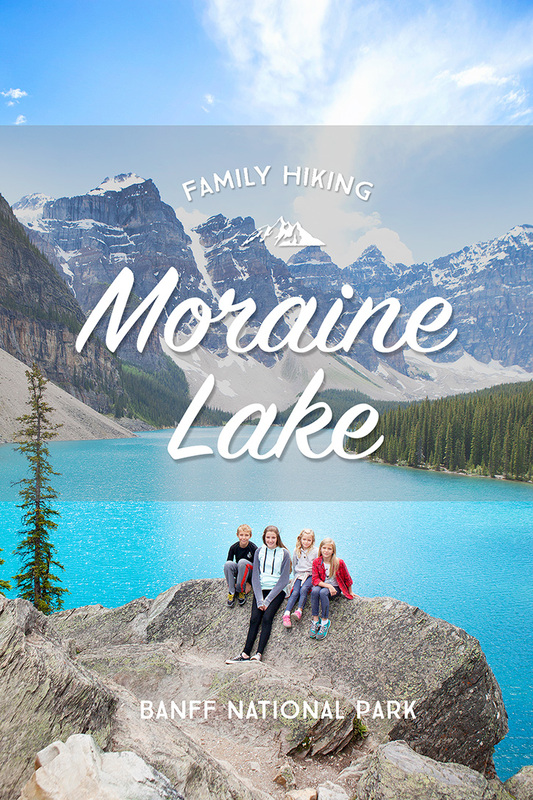 The Moraine Lakeshore trail is another beautiful trail to explore as a family. The 1.5 km trail is shaded and well kept, and it’s lined with signs that taught us interesting facts about the geology of this area. 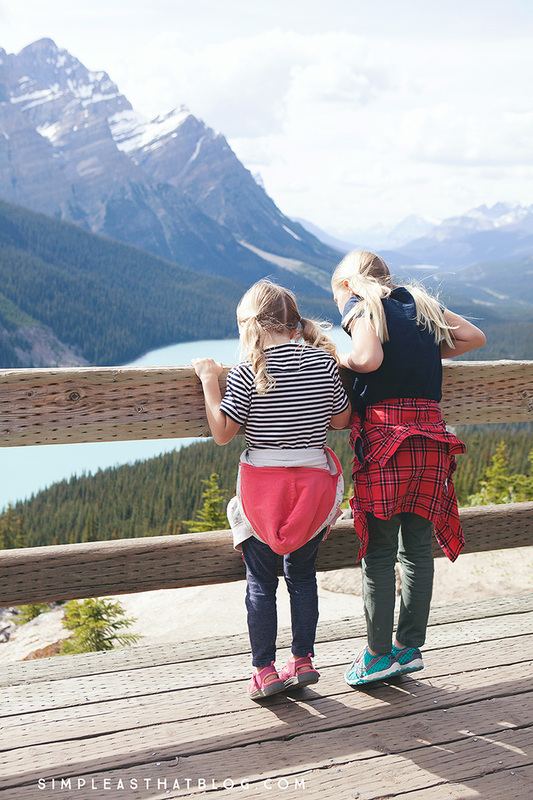 One of the must-see stops along the Icefields Parkway, Peyto Lake viewpoint, is easily accessible and a perfect place for families. Peyto Lake is located approximately 38km (23 miles) north of Lake Louise. The Peyto Lake Lookout is more of a walk than a hike. From the Bow Summit parking lot, the trail up to the viewpoint is a short ten-minute stroll. This lookout, high above the lake, is the best place to see that bright blue water. 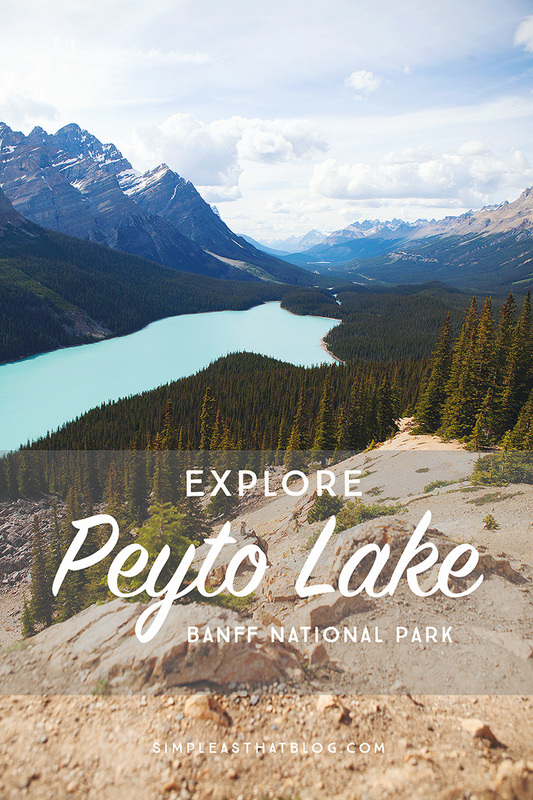 Many people simply take the paved nature trail to the Peyto Lake viewing platform but, if you continue one and climb another 3km (1.9 miles) to the Bow Summit Lookout, you’ll escape the crowds and enjoy some incredible views. Peyto Lake is one of the most popular attractions in Banff National Park. This glacial lake draws visitors from around the world who want to see its turquoise waters and surrounding mountain scenery. Because it’s so easy to access, thousands of tourists flock to the Peyto Lake lookout during the summer, but fewer people make there way here in the winter months. This area gets a lot of snow in the winter, but it’s still accessible. It would make a great snowshoe adventure for the whole family! 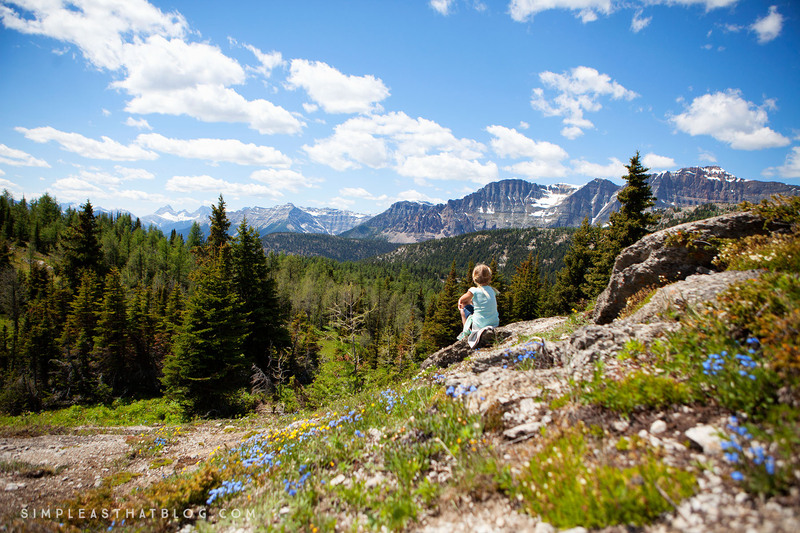 Sunshine Meadows is known as one of the most stunning alpine settings in the Canadian Rockies. Surrounded by some of the highest peaks in the Rockies, the unobstructed views from the meadows are a must-see, and this destination tends to be less crowded than other Banff attractions. It’s no surprise it was named #1 hike in Canada by Lonely Planet in their Discover Canada Guidebook. Our family loved our adventure in Sunshine Meadows! An efficient shuttle bus took us straight to the base of the trail system, which is above the tree line—a rare chance for families since getting above the tree line typically involves a steep climb. Once you’ve arrived, the Sunshine Meadows trails are all considered easy and can be walked by people of any age, in reasonable physical condition. The steepest part of the trail system is at the very beginning, but it’s smooth sailing from there. 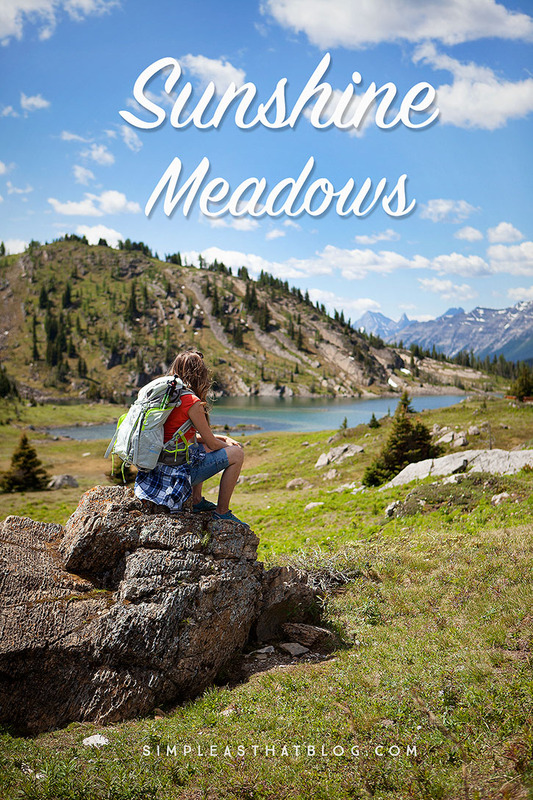 What our family loved most about Sunshine Meadows was how tranquil and quiet it was. We rarely ran into other hikers along the trail and enjoyed the quiet escape from the crowds for an afternoon. We took a leisurely pace, enjoying nature and connecting with each other. We even stopped for a while to let the kids explore the snow and have a summer snowball fight! We opted to do a guided tour and were pleasantly surprised at how much we enjoyed it. Our guide was engaging and developed a noticeable connection with the kids. We learned so much from her about the local plant and animal life. If you’re visiting Banff in the winter be sure to check out their guided Snowshoe Adventures! The Banff Gondola provides an easy, year-round way for visitors to view the town of Banff, the Bow Valley and surrounding mountains from a unique perspective. 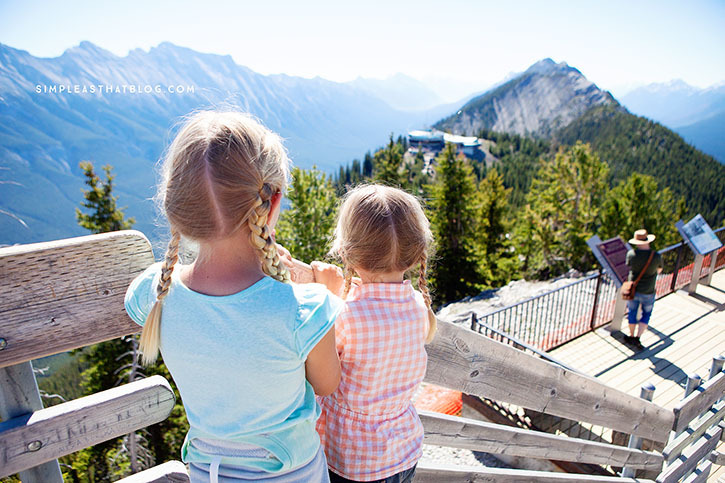 The gondola ride is a perfect option for families, allowing you to skip a good portion of the steep hike up Sulphur Mountain. And more importantly, what kid wouldn’t love 360-degree views from the sky? By the end, you feel like you’re on top of the world. From the observation decks at the summit and the boardwalk trails, scenic mountain views can be seen in every direction. You can opt to hike up to the observation decks. The trailhead starts at the Upper Hot Springs parking lot and is a strenuous 5.5 km (3.4 miles) climb. Once you’ve arrived at the Observation Deck you can follow the boardwalk trail and see remnants of the Cosmic Ray Station, the Sanson Peak Weather Observatory and take in the incredible beauty from this height. The kids found it fascinating to see Banff from this angle! 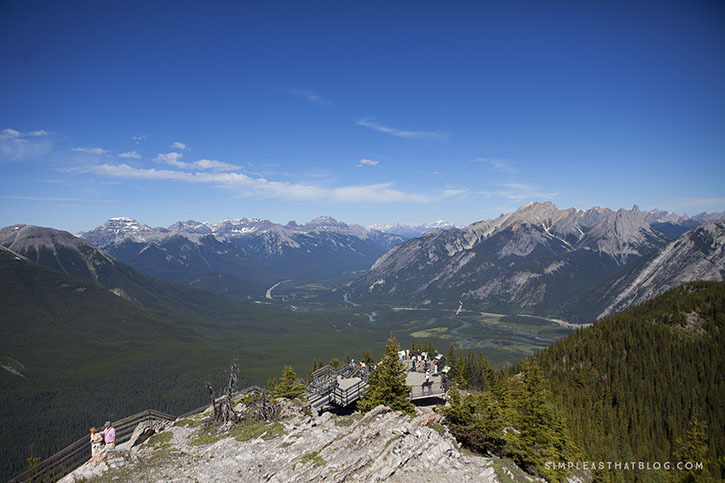 The Banff Gondola operates year round and though the views from the top are completely different in summer and winter, they’re incredible anytime of year! Have you done any of these hikes in Banff? What other trails have you explored as a family? 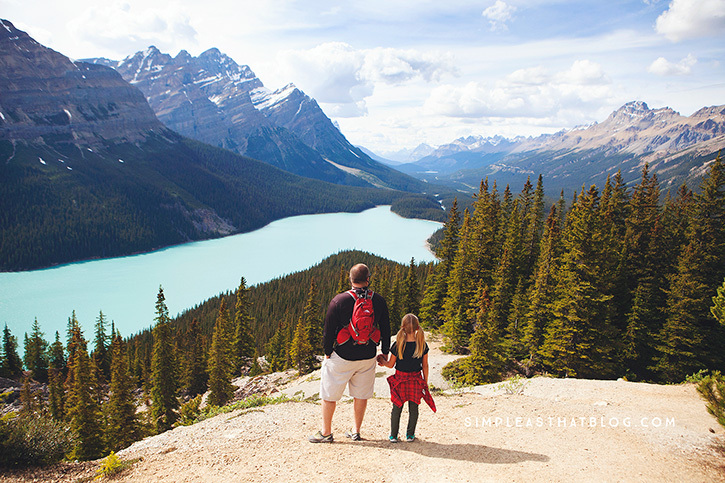 For more information and tips for family travel in Banff National Park, visit these previous posts. I’ve shared a number of posts through the years that may help you make the most your outdoor family adventures! Be sure to check them out! Great suggestions! We went to Sunshine meadows for the first time this year and it was gorgeous! Wasn’t it amazing Christina! My kids loved it – I think a snowshoe adventure there would be incredible! We tried to work Banff into our family vacation to BC a few years ago—but it didn’t work out. 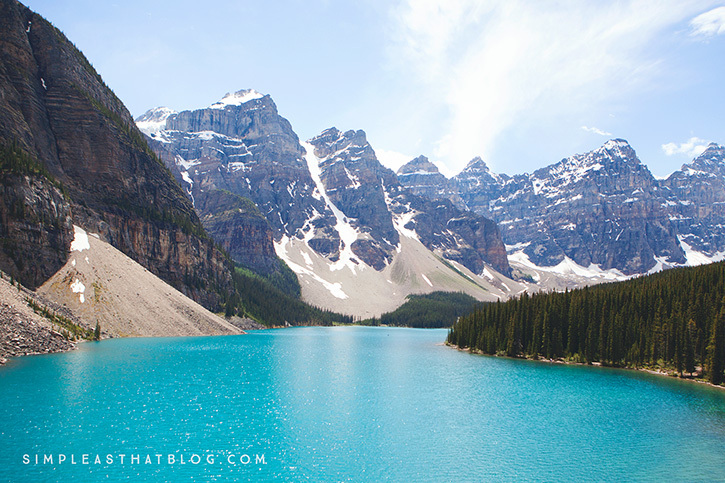 I remember Lake louise from a visit when I was a teenager—it’s as breathtakingly beautiful as I remember! You’ve convinced me that I’ve got to get back! Couldn’t agree more with your family friendly hikes! 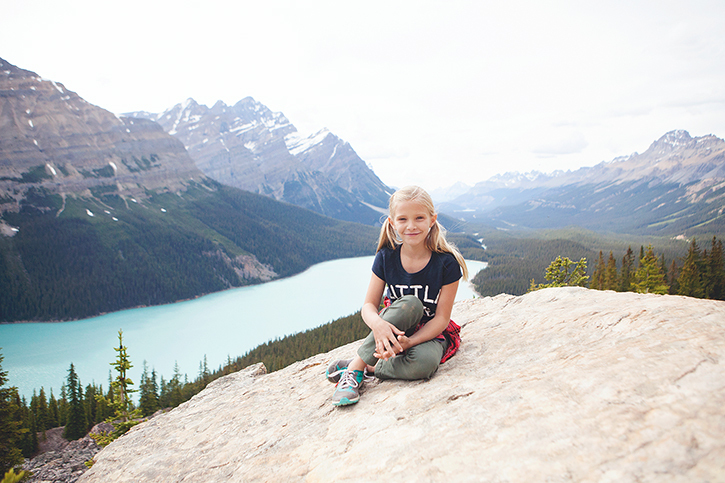 We loved Johnston Canyon, Peyto Lake and the Sulphur Mountain Trail and our 18-month old enjoyed the hikes from her perch in a hiking pack. I’ve started posting our family adventures at http://www.thepaciport.com because I felt like there weren’t enough websites sharing ratings/tips for traveling with young children. So happy to have stumbled across yours for research on future trips! Just curious about what month you traveled in. We were there in June Keith. Your pictures are beautiful! Do you mind sharing what camera and lenses you used for the trip? My family is planning a trip to Canada this summer and I’m looking for a new camera to capture the amazing landscapes. Thank you for sharing your tips regarding family hikes. We will definitely follow your advice this summer.